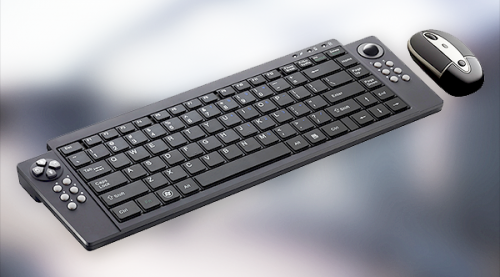 With its 100-foot wireless range, the Rechargeable Media Suite's combination of rechargeable Media Keyboard and Desktop Mouse is an ideal choice for desktops, home entertainment centers, meeting rooms, media centers and other public speaking venues. 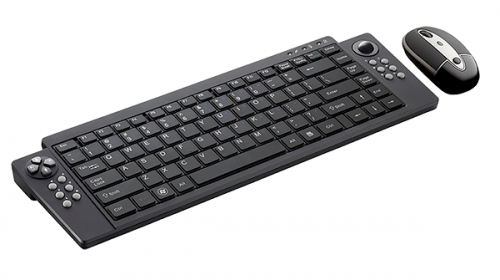 The VersaPoint Rechargeable Wireless Media Suite pairs a rechargeable media keyboard (with integrated trackball, mouse buttons and 12 media hot keys) with a rechargeable desktop mouse. With its 100-foot wireless range, the Media Suite is ideal for office desktops, home entertainment centers, meeting rooms and public speaking venues. This product replaces SMK-Link model VP6315.